Have you ever accidentally met a new best friend? I have. Many times over. My teacher hippie friend Heather and I – who has the most voluminous messy blonde hair you’ll ever hate not having – met at a summer camp in Northern California in 2006 when she took the job as a stand-in lifeguard and I was a 9- and 10-year-old girls counselor. It was her first day and I hated seeing her so alone not knowing anyone, so I walked over and introduced myself. After a spattering of exchanges we quickly bonded over a love for exercise, big hair and blueberries and oatmeal for breakfast. The rest is history. Though we only spent two full months together that summer, we were like sisters by the time I flew back to Kansas in August. And it was one of the most bittersweet days of my young adult life. Another new best friend story I’ve been loving to tell lately is one that happened just recently. John and I were still in the market for a new rental about a month ago. We’d called on a place and made a 3:30 appointment and got there right on the dot. We walked up and were greeted by the realtor…and another couple who’d also been promised a 3:30 showing. You’d think the whole situation would’ve been painfully awkward but one joke from John suggesting the place was big enough to “go splitsies on,” and we were laughing it up like longtime friends. As I tell it now, we totally “hit it off” and have been hanging out ever since. They may not be our “best friends” yet, but I’m working on it. I can only make so much bonding magic happen in a matter of 4 weeks. Our new friends moved here from Ohio and ended up buying a big house right down the street from our new duplex. Upon their arrival they literally had no dishes, furniture or food, so John had the brilliant idea to take them dinner. Why didn’t I, in all of my hostess-y food blogging glory think of that? I decided to attempt enchiladas: Simple, transportable, affordable, and great for pleasing a large crowd. To keep the filling vegetarian, I went with black beans, sour cream, green chilis, and Manchego cheese. And to avoid gluten, I opted for corn tortillas – a first for me, so this was a bit of an experiment. Though they turned out a little bit soggy because I didn’t drench them in hot oil before rolling up – a process I’d read about that sounded complicated and excessive to me – they were super flavorful and filling. This can avoided by simply opting for flour tortillas (see my notes below). I served ours with grilled fajita peppers and onions and a touch more sour cream, and they were simply delicious. John even got seconds, and that’s saying a lot since he’s usually a one serving and out kind of guy. On paper plates in a near-empty living room with wine in Dixie cups, we dined. And we dined well. Chips, salsa, wine and these savory beauties. 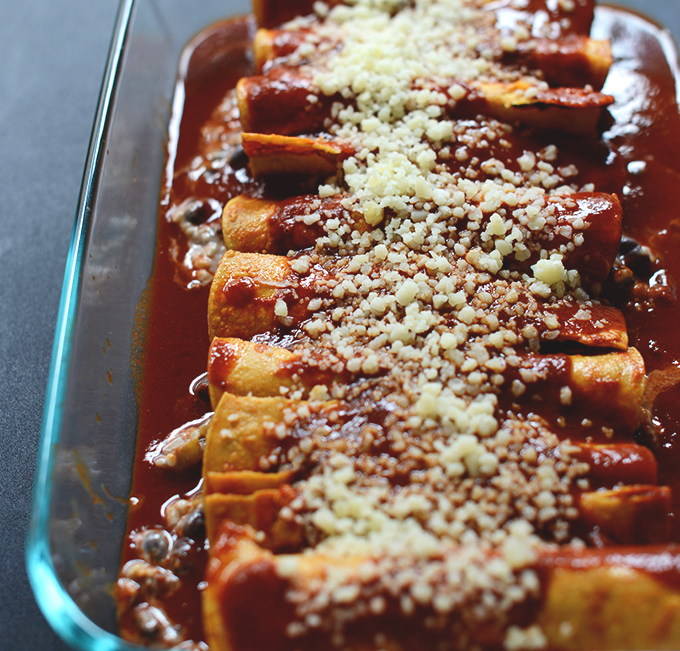 I hope our friends felt welcomed; we sure hope they do now that they are thousands of miles from “home.” Considering their first-time success, I recommend making these enchiladas and sharing with friends – new and old – I have a feeling they’ll kind of love you for it. Promise. 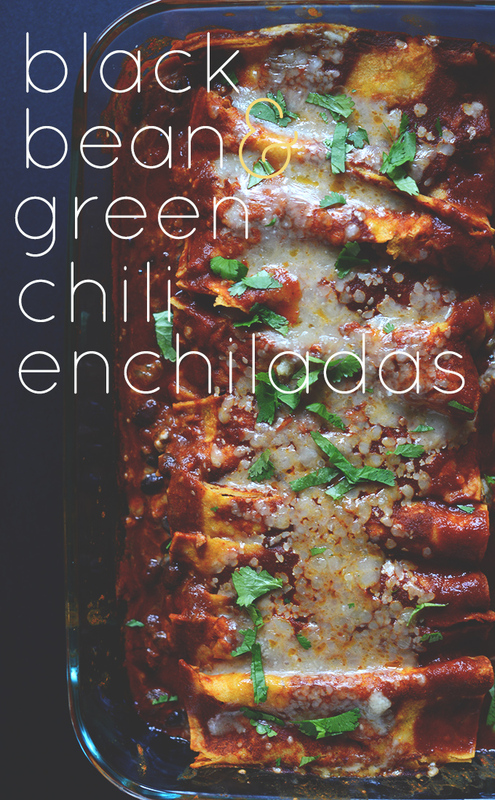 Spicy black bean enchiladas with green chilis, sour cream, Manchego cheese, and fiery red enchilada sauce. Perfect alongside fajita veggies and guacamole. Preheat oven to 375 degrees F (190 C) and position a baking rack in the middle of the oven. 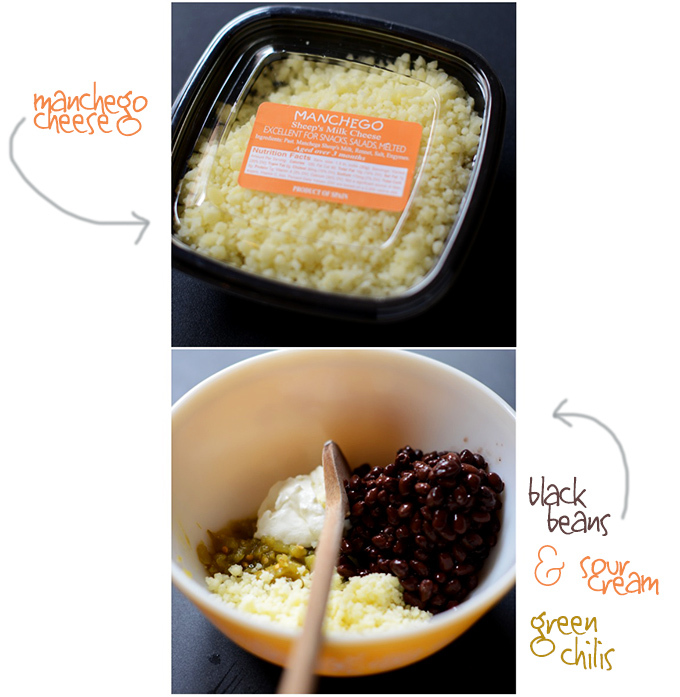 Combine black beans, green chilies, sour cream and manchego cheese in a mixing bowl. Taste and add salt and pepper if desired. Cumin may also be a good addition, but fine without. Set aside. Pour a small amount of enchilada sauce to lightly coat the bottom of a 9x13 dish (adjust pan size if altering batch size). Transfer one tortilla at a time to the baking dish, scoop in 2 Tbsp of the black bean filling and roll up. 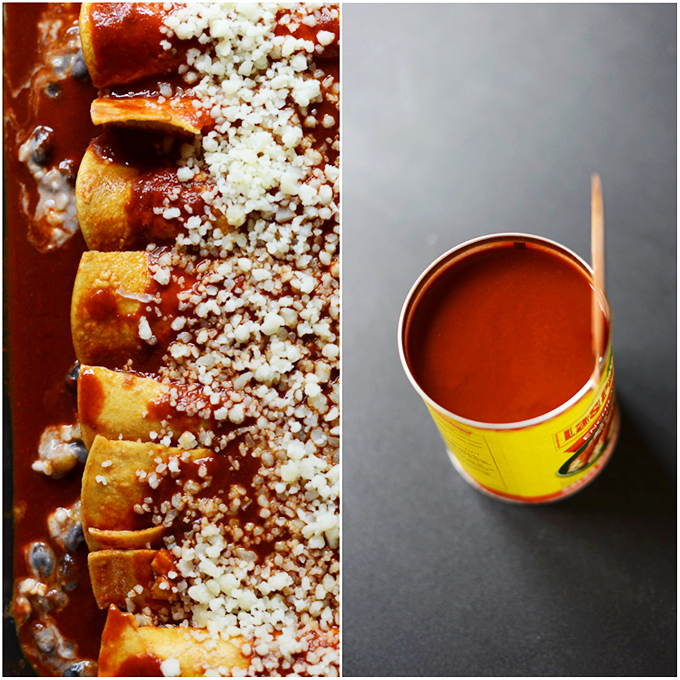 Place seam side down and continue until the pan is filled – should be about 10-12 enchiladas (as original recipe is written). Top enchiladas with a bit more enchilada sauce down the middle (adding too much sauce can make these soggy). Top with a bit more cheese and bake for 15-20 minutes or until the cheese is bubbly. Serve with toppings such as avocado, guacamole, salsa, fajita veggies, sour cream, green onion, cilantro or lettuce. Will keep in the fridge for a couple days. Reheat in oven or microwave. *Nutrition information is a rough estimate for 2 enchiladas without additional toppings. aww I love your recipes but if you are going to advertise your brand as plant-based you should only have plant-based recipes? These loom amazing! Does your recipe for Easy Red Enchalada Sauce have the a little more or about the same heat and flavor as Las Palamas sauce? Thanks! It was easy to make and delicious. We loved it. Thank you for sharing with us. Yay! We’re glad to hear it, Niralee! I loved this recipe! My whole family loved it. My fiance and stepdaughter eat meat and usually complain the days I have them go meatless for dinner but I didn’t hear a single complaint about these enchiladas and they both went back for seconds. our unborn child also seems to love them because this is only thing I can keep down so thank you! Love this dish, very simple and my teenage son is loving it too! We sub vegan cheese but need to figure out a sub for the Greek yogurt to make it totally vegan. Your site is so great and we’ve enjoyed many wonderful meals. I tell my son who is transitioning to veganism- we can thank Dana in Portland for the great food we are now eating!! Made these last night. Used leftover cuban black beans but otherwise followed recipe. Love them. Boyfriend loved them too. In fact, I think I will make a double batch and freeze next time. Sorry to post twice but I didn’t rate the recipe. 5 stars ⭐️! Literally just made these. I used the cumin in the bean mixture as recommended and Colby cheese. I used large flour tortillas by Mission since thats all I had. I didn’t have enchilada sauce so I google a recipe and had all the ingredients on hand, my it came out perfect, quick, and easy! I also threw in some rice/black beans I had in the fridge from 2 nights ago, why not! I followed the instructions just as you stated for this recipe. Adding only a little sauce to the bottom. I prerolled before placing them in the pan because I had a weird shaped glass pot (oval shaped). Added a little more sauce to top and a little cheese! Omg I wish I could’ve eaten all of these. They were sooooo good. Crispy on the edges and the perfect filling, not so mushy but just right. Melted in my mouth. Definitely making these again! Thank you! Perfect meatless dinner! Although I didn’t totally follow the recipe, I was inspired and encouraged to make enchiladas for my dinner which was a huge win for my dinner party of uno. Thanks for reminding me to take the time to cook good food…this came together quickly and tasted great! I made this the night before last. It was SO easy! I added some veggie crumbles in with the black beans, but that’s the only change I made. I have to say they were even better the second day. SO GOOD. i made this recipe yesterday and it was very good. I added cumin, which enhances trohe flavors of the other ingredients. I also added some roasted chicken. The 28oz can was way too much. I think the smaller can would be sufficient. All in all, it is a great recipe! I will make it again. If you want to go GF and avoid tortilla altogether, use long zucchini slices on the mandarin. This is one of my favorites from this blog (and EVERY recipe I have made from here has been amazing.) It is so easy and delicious – a perfect meal for having friends over as it is easy to make in large batches. I’m a huge fan of the green chilies in here – it really makes the dish unique. The only alteration I made to the recipe is that I found I needed much less enchilada sauce than the recipe called for. Came out delish! I also only used a 10oz can of sauce and still had some left over. I think I worried too much about using too much sauce, I will use the whole can next time. Corn tortillas were a little hard to roll, but I think the flavor was amazing. And I don’t mind having some tortillas fall apart-it all tastes the same once it’s baked! Made these tonight and they were delish!! Used queso fresco as a substitute. Not the best melting cheese but tastes great and allows for no additional salt as its already salty enough. Good call on not using all the sauce too! Wow, these are pretty dang fantastic! Hubs and the kiddo both loved them. Thanks for the great recipe. What a great, inexpensive meal! My hubby and I loved this recipe! Instead of using a 28oz can of enchilada sauce I just used a 10oz can. Not soggy at all… Delicious! I will make this recipe again for my friends. Is the nutrition information using flour or corn tortillas? Just wanted to drop off a quick warning since not all vegetarians are aware, but Manchego is generally not a vegetarian cheese as it contains rennet(an enzyme sourced from cows stomachs). Quite a few cheeses contain this, including Parmesan, Gorgonzola, and Romano just to name a few. Dana! Just made these the key for not oil flipping the tortillas and still using corn is just heat a pan and let each tortilla warm on each side learned this trick from my mom and does wonders for the “soggy” tortilla problem! My fiancé loved this recipe and went back for seconds as well ;) thank you for all your wonderful dinner ideas use more than 3 of them each week you are awesome lady!!! Made these last night and yum! I topped ours with cilantro and fresh guacamole and they were delicious. The texture was a tiny bit lacking, so next time I may add some yellow onion to the filling. The filling by itself scooped up on a tortilla chip was fantastic too, so this would make a great dip! Oh man, these did not turn out well at all — which I was totally shocked by, since all your recipes I’ve made (lots) have turned out great. I’m assuming it’s something I did, but I followed the instructions… Any idea why they would have turned out super mushy? They basically fell apart when I tried to get them out and were just not very pleasant. I’d definitely give them a second try if I knew what to do differently! Hi Arwen! So sorry you had trouble with these! It could be because you added too much sauce which can make them soggy. Next time only add a little sauce to the bottom, leave the tortillas bare and roll up the filling, and drizzle a bit more sauce down the middle. This should help them crisp up! I’ll definitely try that next time. Thanks, Dana! I also added a few notes in the recipe, for anyone curious! Since making these with less sauce, I do prefer them that way. Sorry to confuse! 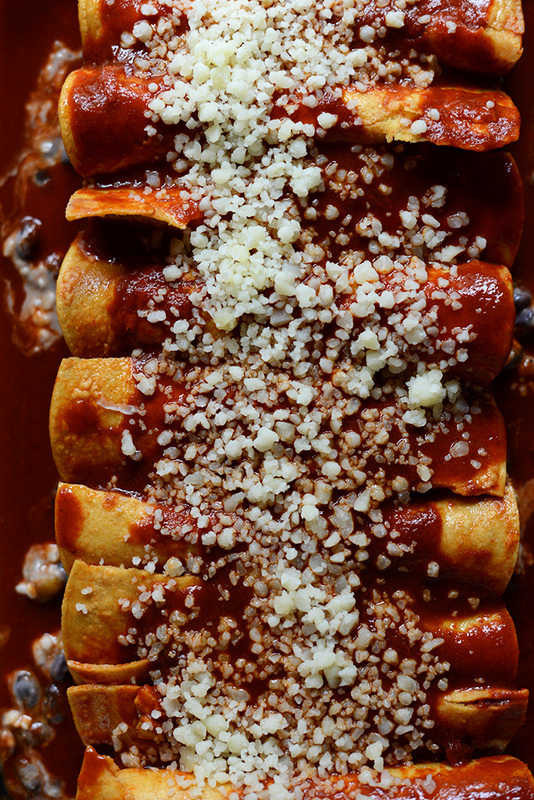 Enchiladas are not made with flour, it’s not traditional. When it is, it’s gummy and mushy. Try corn. Made these and they were a huge hit with the family! We love a good vegetarian recipe. Just wondering if these would work as a freezer meal? Hmm, I think so! I haven’t tried it, but I would guess it would work well! Wonderful! Thanks for sharing, Sindi! These were awesome! Made them tonight for my son and I as an alternative to some form of meat. My son, the picky don’t like anything boy, ate three! The only changes I made was to add a bit of garlic and some retried bean. Yay! Glad you enjoyed them, Tam! Thanks for the tip! I actually tried that method this week! Helped so much. In my family We microwave the tortillas. Might be less work . I have been previously browsing on-line above Three hours these days, but I by no means discovered just about any attention-grabbing write-up similar to your own house. It can be wonderful amount sufficient personally. In my opinion, if most website owners along with people built superb articles just like you likely would, websites generally is a whole lot more handy than before. Hi, That looks delicious. Can you tell me the name of the font you used in the title image? These look great, though I’d have to adapt them for my 6 year old, since he’s allergic to not only gluten but also dairy. 1. Corn tortillas are quite easy to roll if you invest about $5 in one of those silly looking plastic tortilla warmers. Put a stack in, put the lid on, and microwave them for about a minute. They’ll be steamy hot and flexible. 2. Those who are gluten free should check ingredients on the enchilada sauce, since it’s sometimes thickened with flour. I always make my own, in part because of that and also to make it natural, cheaper and tastier. :) I’m still on a quest for either the perfect canned sauce or the perfect easy recipe for enchilada sauce, though. I know it’s not supposed to have tomatoes to be authentic, and most of the quick recipes are tomato based. A friend recommended your site as a favorite for gluten free recipes. I’m off to look around! And now I have to make enchiladas tonight. Believe DAT. That first photo?! Hell to the yeah. Holy frioles! Where these ever amazing! I made them for dinner tonight and my friend and I thought they were super yummy. I’m even looking forward to the leftovers. Just a little spice to add some flavor but without the crazy heat, which was perfect since the salsa we had was ridiculously spicy. Thanks for a great recipe. Awww!! Of all days I happen to randomly visit your page & I see this story- talk about nostalgia! Such sweet, fond memories of that summer with my new blonde sister :) Thanks for sharing, I am very touched. Love you! And dude, I totally get the non-drenching of the tortillas beforehand. Who has the time for that?! Warmed my heart and made me crave Mexican food–I’ve never heard about the rolling in hot oil trick. Will have to experiment! wow! These look delicious! 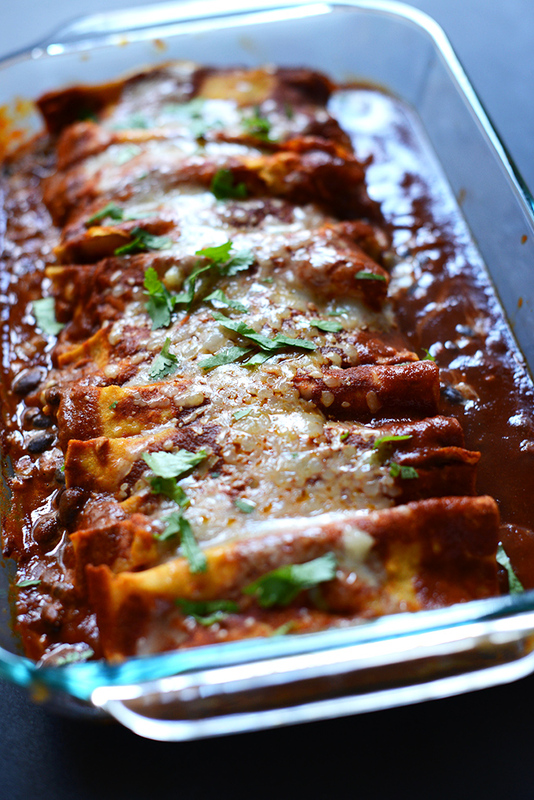 I never thought about using manchego cheese when making enchiladas! Totally LOVE this recipe! What an awesome, quick, dinner recipe! I think I’m in love with these. The flavors here are magical! This looks delicious! Going to make them tonight. Personally as someone who grew up in New Mexico, I can’t imagine enchiladas with flour tortillas that’s just… Wrong!!! Corn is the only way! A quick flash fry with oil makes them bendable so that you can roll them, and also adds the taste but I don’t always fry mine. However, my local grocery store in upstate New York (Hannafords) sells a corn/flour combo tortilla that might be an awesome compromise here. It has the corn to keep it authentic but the flour would make it less necessary to fry. I wonder if they sell those anywhere else, they are awesome! I’m also wondering if this is really that spicey. Canned green chiles are almost tasteless and certainly not spicey (come to New Mexico to try them fresh!) and canned red chile enchilada sauce is usually very mild as well. Am I missing an ingredient that adds heat? I’m actually fine with them not spicey— these are all great flavors. 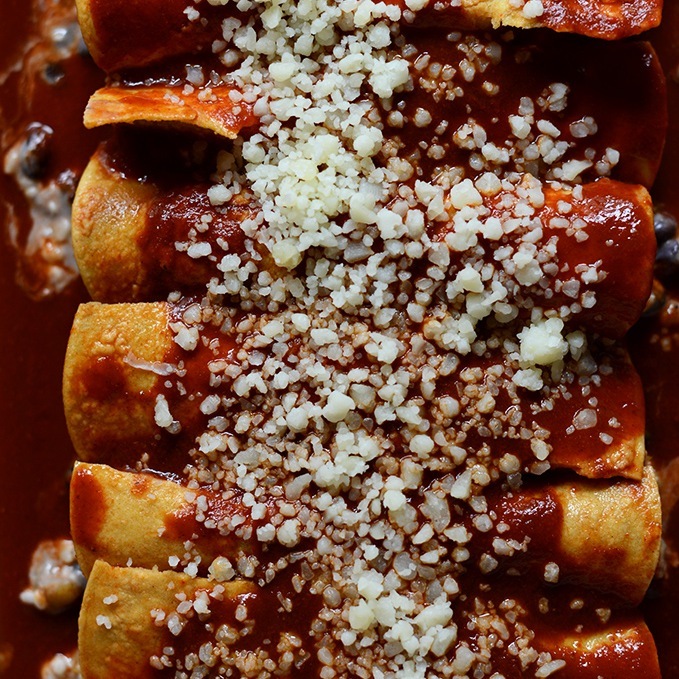 From the picture, it looks like she used Las Palmas sauce, which is made of dried red chiles instead of the usual American “enchilada sauce” made of tomato sauce. There are lots of sites online where people complain about the spiciness of even the mild Las Palmas sauce, so I’m guessing that’s the source of the heat. I want you guys for neighbors, you sound fun and delicious! I mean your enchiladas sound delicious, not you! Seriously these look and sound awesome. I love the black beans and mango, perfect combo! Who has time for all that oil-drenching of corn tortillas when there is wine in dixie cups to be had?! Sounds like such a fun dinner, and such a great dish to take to friends – I would most definitely feel very welcome.